Step 1 Rinse the grape leaves well under cold water and pat dry. Set aside. Step 2 Heat the olive and canola oil in a large saucepan, and cook the onions over medium heat until transparent, about 10 minutes. Stir in the rice and one-half cup water and continue to cook for 2 minutes. Stir in the tomato sauce, parsley, allspice, cinnamon, cayenne, dill and pine nuts. Step 3Continue cooking until the rice is somewhat soft but not fully cooked (it will look al dente -- tender on the outside with a white core in the center), about 20 minutes, stirring frequently. The water may be absorbed completely before the rice is par-cooked; add additional water, a little at a time, until the rice is somewhat softened. Add the juice of 2 lemons. Remove from heat and season with salt and pepper to taste. Set aside to cool. Step 4Heat the oven to 375 degrees. Step 5Stuff the grape leaves: Stem the leaves and place a leaf, shiny-side down, on a plate. Place a rounded tablespoon of filling in the center of each leaf. Fold the sides of the leaves in toward the center, then roll the leaf into a cigar shape. Do not roll too tightly, as the filling will expand as it cooks. Place the leaves in a deep baking dish or Dutch oven, packing them in to form 2 layers. Step 6Combine the remaining 2 cups of water with 2 tablespoons lemon juice and 1 tablespoon olive oil. Pour the mixture over the stuffed grape leaves (it should almost cover the stuffed leaves), then cover the pan or Dutch oven with foil. Bake the stuffed grape leaves until tender, about 30 minutes to 1 hour (timing will vary depending on the brand, size and type of grape leaves). Remove from heat and cool before serving. Garnish with lemon slices. In Recipes-list.com we have selected the most viewed recipes from category - Appetizers Healthy eating Vegetarian . Enjoy the best recipes specially selected for you! 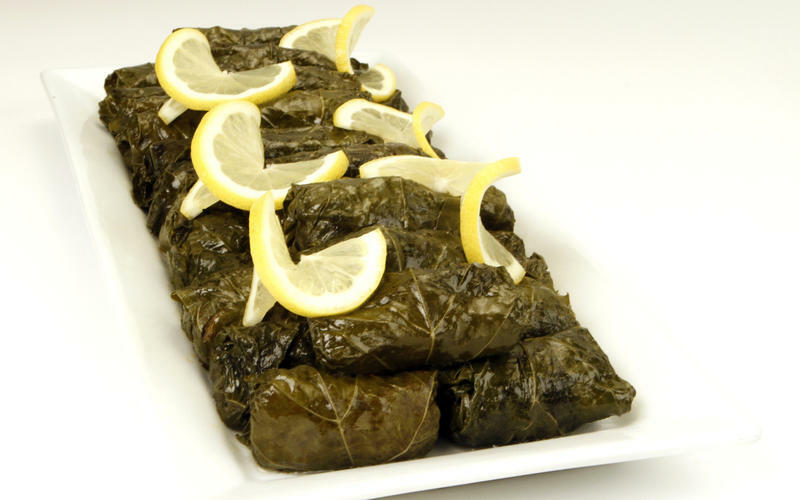 Aunt Mary's yalanchi (stuffed grape leaves) is the right choice that will satisfy all your claims.